I thought I'd keep some V-day stuff up for the beginning of this month, then I realized that Easter is at the end of this month! Crazy. No stinkin way! I got busy and it all came down the 28th. I have decorated for spring and it feels good, now if we could just get rid of the snow outside! I am a non-traditionalist when it comes to Easter. The only 'traditional' thing we do is a hunt, which is, after a big family dinner with 'family'. I think Easter, even more than Christmas, has lost meaning. With Christmas there are still nativities sold, carols we sing, some semblance of Christ in that holiday. We have forgotten the focus of this holiday, this miraculous moment for which we celebrate. For our family there is no bunny, there are no gifts, and the hunt is family-focused. I want to bring more meaning into Easter, for our family. I am starting this year, with decor. It has bothered me for the last couple of years that I only have bunnies and eggs to celebrate this time of year. I want reflections of our Savior. 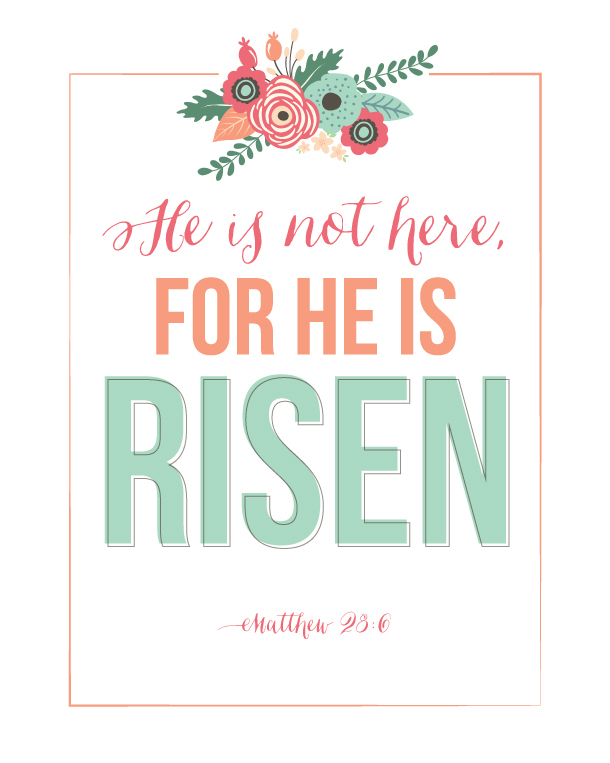 I want his resurrection to be present and celebrated in our home. I started with my mantle and created a large print stating boldly that indeed He lives! I'll show you the finished product soon! I printed it 20 x 20. I am excited to have this be the focus in our family room. I created these other two in 8x10 and 5x7 sizes. One will go in my kitchen and one upstairs. Feel free to download themfor your own personal use. I got all of the floral wreaths at Freepik, aren't they pretty? Attribution: pink and green wreath, purple and yellow, spring banner. The oval penciled frame is from: We Lived Happily Ever After. I added my own text and other design elements. I also love this printable from LandeeSeeLandeeDo. It is in my entry way! Perspective Design and Decor... Client #1 - Family Room!